Villa Masca is a pleasant 3 bedroom villa, which is a part of the Panoramica Heights Complex and has access to the facilities, including a mini market, restaurant and a large communal swimming pool. This villa also has wonderful distant sea views from the balcony. There is a private swimming pool and villa is spacious inside and out. What's not to love? Air conditioning/heating in the bedrooms and lounge, pool heating and WiFi are included. With an access to the facilities of the complex, a private swimming pool and breath-taking views from the balcony - you will love Villa Masca! The outside area of Villa Masca is spacious and there is plenty of space to enjoy Canarian sun or splash in the private pool, which is all one depth - 5 feet. There is a pergola with a table and chairs next to the brick BBQ - perfect for alfresco dining. A covered terrace with table and chairs is at the front of the villa making it a suitable place to escape the sun with a book or refreshing drink. Villa Masca has space for car parking inside the complex. The entrance to the villa is through the private gates. Entering through the front door of this bright and comfortable villa you will find the lounge and dining area. Here you will find a sofa, coffee table, a flat screen TV, with a dining table and chairs. The kitchen is adjacent and is equipped with all modern appliances. There is a back door also leading to the rear terrace and to the pool area. On the lower level there is an additional seating area, a flat screen TV and pool table - great for couples and small groups. A central staircase leads up to the first floor where all 3 bedrooms are located. The double bedroom has an en suite bathroom and the most magnificent distant views over the resort and out to the Atlantic Ocean. The 2 twin bedrooms are separated by a shared shower room on this floor. There is a WC on the ground floor. Villa Masca is a semi-detached villa and a part of the Panoramica Heights Complex that sits in an elevated position with the stunning views over the resort of Costa Adeje and Atlantic Ocean. The resort centre is a 5-10 minute drive away by car and has great beaches, a marina and a waterpark. Our Villa Teno is next door. There are 4 other villas we feature on this complex, Villas Borondon, Ifara, Tamaimo and Taganana - so great for large groups! If you need some supplies, there is a small mini market located in the reception. In the resort of Las Americas you can find a huge array of shops - from kiosks to designer boutique shops. There is a busy local market on Thursday and Saturday in nearby Fanabe. There is on site restaurant offering breakfast, lunch and dinner. In Costa Adeje centre there's a range of local and international eateries as well as a variety of places to enjoy a drink ranging from contemporary chill out bars to family friendly pubs with live entertainment. It takes 5-10 minutes in a car to get to the centre. The closest beaches to the villa are Costa Adeje and Callao Salvaje, which can be reached within a 5 minute drive. There are a number of beaches located in the south of Tenerife, from expansive sandy stretches, to smaller black sands. Long promenades run the full length from Los Cristianos to La Caleta, with plenty of watersports available, and almost all beaches offering services along with beach huts, ice cream stands and showers. There are also Playa La Pinta, Playa De Bobo, Playa De Troya beaches - all within a 5 minute drive away. The famous Siam Park is so much more than a water park! You can try water slides, stroll around the winding pathways, visit authentic Thai themed floating market or enjoy your favourite drinks and have snack or a meal. Aqua Land is more suitable for younger children as it offers a greater choice of rides. Towards Fanabe there is Mikki Play Park opposite the market, offering a ball park, a small mini golf course and a selection of games. Whale and dolphin watching is great for a day out and you can catch a boat from Porto Colon Marina. In the local area is a Tennis Club, Aqua Spa and paddle courts. Mount Teide is probably the most popular attraction in Tenerife and is the highest point in Spain and the highest point above sea level in the islands of the Atlantic. There's a great selection of golf courses dotted around the south of Tenerife. Las Americas Golf Course and Club is the closest to Villa Masca. Some great walks and hikes can be arranged during your stay as well as downhill bike riding, paragliding and scuba diving, which are also popular activities in Tenerife. Alternatively, you can combine a trek from the historical village of Masca down to the pirate bay. Take a look here at the Tenerife villas that are currently on sale. Villa Masca is not available to book for season as it is sold out. Take a look here at the Tenerife villas that are currently on sale. Set in a tropical oasis which reflects the ancient kingdom of Thailand, you can enjoy some of the most breath-taking water rides ever created by man. The park has a manmade beach, plenty of rides, cafes and restaurants, lockers and shops are available. Exit 29 TF1. Playa de las Americas. Golf Costa Adeje is surprising because it is superbly adapted to its surroundings. Pepe Gancedo designed an unusual layout respecting the old farm terraces that slope down to the sea framed by the original dry stone walls. With really beautiful views of the ocean, the island of La Gomera and the rugged Adeje Mountains, this unique golf course features 27 holes on wide greens and obstacles such as gorges and lakes. The pleasant and spacious Club House has large terraces and a central courtyard. An unusual feature is the lift which takes you down to the driving range in your buggy. The highest peak in Spain standing at 3718 metres, declared a World Heritage Site by Unesco, is an absolute must. Beautiful and grandiose, it will make you feel very small. The Teide National Park in the centre of the island of Tenerife, shelters the best example of the supra-Mediterranean vegetation level. The Mount Teide National Park offers one of the most spectacular examples of volcanism in the world. This National Park, is the largest and the oldest of the National Parks of the Canary Islands. This natural area is surrounded by the Corona Forestal Nature Park, the largest protected natural area of the Canary Islands. Part of the route can be done by cable car allows anyone, no matter what their physical condition is, to make the scent. The more adventurous can ascend on foot by the path that leaves from the area on Montana Blanca, next to the road. The cable car service, which runs every day if the weather conditions allow, reaches the area known as the Rambleta. The rest of the ascent, must be made on foot. Access to the peak (along the Telesfero Bravo path) is restricted and you need to apply for a permit to reach the summit whether you are on foot or going by cable car. Permits can be applied for in person, by post, fax or email to the Administrative Office of the Teide National Park, located in the city of Santa Cruz de Tenerife (permits cannot be granted in the park itself). If you do not have a permit, you are allowed to go in the direction of the viewpoints for the Fortaleza and the Pico Viejo using other paths that leave from the Rambleta. These offer excellent views. 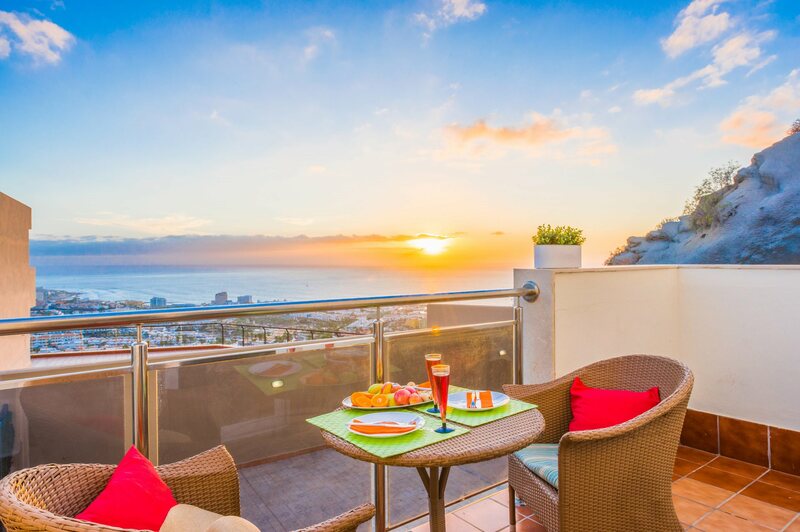 There are many distinct areas to Playa de las Americas making it a great family choice, with everything you need for an enjoyable beach holiday. For teenagers, Playa de las Americas is a lively, cosmopolitan resort with fantastic facilities and vibrant nightlife, with a lot of the action concentrated in a very small area known as Veronicas Strip. By day, there is a huge array of water sports to try. If you want a bit of sophistication, the Mare Nostrum complex is filled with international restaurants and stylish cocktail bars. Or there's the Magma Centre if you fancy a touch of Las Vegas, with top international entertainers and casinos. If retail therapy is your thing, you can go from top notch shopping complexes selling designer clothes, perfume and jewellery to the big sprawling weekly market in nearby Los Cristianos. For small children there are wonderful waterparks such as Aqualand is well worth a visit, with its many pools, slides and even dolphin shows. Then there are zoos, mini golf, nature reserves and all the excitement of the beach.~ Your Villa Plus villa would be slightly out of town, so that you could enjoy the best of all worlds on offer, with something for every generation to write home about. Fabulous villa in a great location. Privacy and facilities were good. We had a brilliant time and would definitely book again. Villa was fantastic in a beautiful location. Clean and very comfortable. Overall this was a very good value villa, honestly and fully described on the website. We had a great holiday and will certainly use Villa Plus again. Villa was exactly as in photos, fantastic - so pleased with everything. Villa met our expectations exactly, the pool and outside area was excellent. The service of the complex staff and support if needed, by the Villa Plus representative are there if required. Would highly recommend this property! Our 10th year in Tenerife and our first Villa. Wow! Would do it all again. Villa exceeded expectations with excellent facilities..... Peaceful, secure location with easy walk down to stores and cheap (3 Euro) return taxi. Excellent service from Rep and maintenance/pool man. Would go back again tomorrow. Brilliant.